These small carnivorous mammals hunt at night, purr like cats, and can release defensive sprays like skunks. Despite possessing what is often considered a "cute and cuddly" appearance, the carnivorous American Mink is actually a proficient predator. The American mink is a mammal and member of the weasel family, Mustelidae. Because of their slender bodies, which usually measures approximately two feet long, this animal somewhat resembles their close relatives, the domestic ferret. Other physical characteristics of the mink include short legs and tiny eyes and ears, as well as webbed feet. Minks have a thick tail, which makes up about one-third of the animal’s entire body length. The animal’s fur is soft but oily, which is essential for repelling water. American minks have dark colored fur in varying shades of black or brown, along with having white patches under their chins and throats. Minks have been traditionally hunted for their valuable fur, which is used to make clothing. The American mink is a carnivore and, as such, its diet includes an array of small terrestrial animals as well as fish. A typical meal for these animals usually consists of creatures such as snakes, rabbits, insects, frogs, or mice. Minks are apt hunters who kill their prey by chomping down on their victims' necks or throat regions. Although these aggressive animals may be active during the day, minks are largely nocturnal creatures who prefer hunting under the cover of darkness. Due to their strong swimming skills, minks have the ability to dive 16 feet below the surface in order to catch fish. Interestingly, they're also known to save up extra food in caches within their dens to be eaten some time later, when food may be less plentiful. The American mink is native to North America, and can be found throughout the US as well as much of Canada. The only areas where they don’t generally thrive in the US are in Hawaii and Arizona, as well as portions of Utah, Texas, California, and New Mexico. Due to relocation efforts by human beings, the American mink can now be found as an introduced species in parts of Europe and Asia. Because they are semi-aquatic, American minks flourish in wetlands and near rivers or other water sources. These animals prefer to reside near the water where they build their homes by burrowing into trees or along riverbanks. Although they do not like living in one place for long periods of time, they commonly make their homes in the abandoned huts or dens of other semi-aquatic animals, such as muskrats and beavers. The American mink splits its time between staying on land and swimming in the water. They are solitary creatures, and only pair up during mating season. Minks are very territorial, and use their strong sense of smell to stake their claims. Males and females of the species usually occupy separate territories which can vary considerably in size, and some stretch to cover areas as large as several miles long. Much like skunks, minks protect themselves by spraying their enemies when confronted. When it finds itself in a fight, it is not shy about defending itself or its territory. More surprising, however, is that the mink is also known to be able to emit a purring sound similar to those made by content felines. 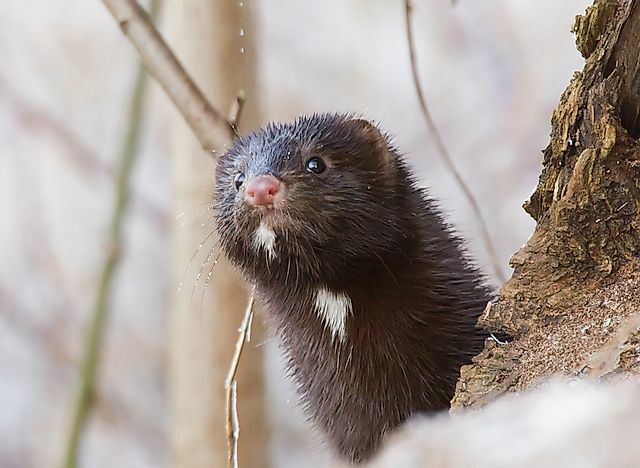 Because of their solitary lifestyles, male and female American minks only engage in reproductive activities during a well-defined mating season, which takes place from January through April of each year. Gestation usually takes 40 to 75 days, with females giving birth in comfortable nests lined with soft fur. A typical litter consists of three to six offspring, which are also referred to as "cubs" and "kits". Females of the species are solely responsible for caring for the babies, which are weaned at about five to eight weeks of age. American minks are generally considered to have reached maturity after about ten months after birth. Minks only have one litter per year. In terms of lifespan, the American mink will live for an average of eight years in captivity. This page was last updated on December 6, 2017.